Learn the elements of a circle story. 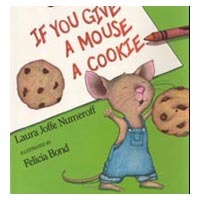 If You Give a Mouse a Cookie by Laura Joffe Numeroff tells a story of what happens to a boy who gives a mouse a cookie. The boy soon realises that the mouse will want more than just a cookie. To go with the cookie, the mouse wants a glass of milk, then a straw, then a napkin, then a mirror, a pair of scissors, and so the list goes on and on. Read If You Give a Mouse a Cookie by Laura Numeroff to your child. Talk with your child how If You Give a Mouse a Cookie is a circle story because each event is dependent on the previous event and the story could continue endlessly. Talk about how each event in the story leads to the next event. For example, if you give a mouse a cookie, then the mouse wants a glass of milk. If you give a mouse a glass of milk, then the mouse wants a straw. And so on. Inside a large plastic bag, the “cookie jar,” provide the following items: a bag of mini cookies, a small, empty milk carton, a straw, a napkin, a small mirror, a pair of student scissors, a tiny craft broom, a tiny mop (or a picture), a scrap of fabric for a blanket, a miniature book, a box of crayons or a note pad, a pen, and an empty tape dispenser. Model how to use the props to retell the story. Then let your child practice retelling the story. Use story picture to let children re-tell the story. Discuss with your children what mice look like, how many ears and eyes and whiskers they have. Let them create their own mouse with shapes provided. Different size circles, small triangles, rectangle. Provide drinking straws to measure different objects in the classroom or in your house such as the table, a piece of paper, a book, a toy, etc. Have children pretend to be mice. 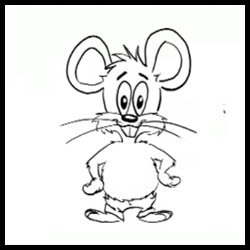 Ask children how a mouse moves, and make different movements: crawl, clean their whiskers, yawn, run, eat, etc. Like a little mouse should. To listen for a snap.